A couple of years ago I hunted down and bought a full bottle of Amarige Harvest Mimosa 2007 by Givenchy. I’m not sure what I liked about this perfume: a smell of a mimosa in it, the idea of a mimosa note in it or my quest for this perfume that smelled more and more like a mimosa as my tiny sample vial was nearing the end? I don’t know but I still like this bitter and slightly woodsy scent and enjoy wearing it from time to time. Last year I got a sample of Mimosa by Calypso Christiane Celle. I found it to be too linear and soapy. The scent I wouldn’t mind in my bath products but not as my perfume. A week ago a sample of Mimosa pour Moi by L’Artisan Parfumeur came in the package from Luckyscent. I’ve read so many nice reviews for it that I really hoped to like it. I did like it somewhat. But I cannot smell any mimosa in it. It’s a very fresh and delicate spring bouquet, I wouldn’t mind wearing it if I happen to come across a stray bottle but I will not be actively seeking it. A several days ago I finally managed to get my hands on a sample of Annick Goutal‘s Le Mimosa. It took two trips to the mall and a very friendly and willing to help SA. I waited for that perfume since I read an announcement about its upcoming launch on one of the blogs. I wanted to love it and already imagined a bottle with that cute polka-dot bow in my collection. It’s a very bright, fruity, happy and … awfully nauseating scent on my skin. I smell no mimosa but a lot of peach. And this particular peach almost makes me hurl. Today while looking for real reviews that I liked reading earlier and would like to recommend (since I do not do perfume reviews in this blog) I stumbled upon Jessica’s review of the Amouage Library Collection Opus III in which she focuses on the mimosa note in this perfume. I had to dig out my sample of this wonderful creation and test it again. Either it’s a power of suggestion or my nose got trained in recent days but I think now I can smell mimosa among top notes of Opus III. It is not my favorite perfume from Amouage line but I would gladly wear it while my sample lasts. Unlike some other perfumes by Amouage it doesn’t feel too heavy for warm weather. There are other mimosa-centric perfumes but for now I’m putting on hold my active search for a perfect mimosa scent (ok, right after I try Une Fleur de Cassie by Frédéric Malle which I’ve already ordered). Happy Women’s Day to all women – either you observe this holiday or not. 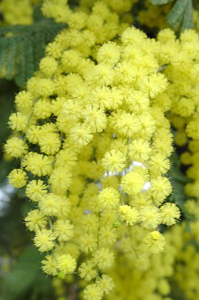 * This “mimosa” is actually from Acacia dealbata (Silver Wattle). Read great articles about the flower and perfumes based on the note on fragrantica and 1000 fragrances ; reviews on I Smell Therefore I Am, Perfume Smellin’ Things and This Blog Really Stinks. This entry was posted in Bête Noire, Favorite Perfumes, Not a Review, Single Note Exploration and tagged Amarige Harvest Mimosa, Amouage, Annick Goutal, Givenchy, L'Artisan Parfumeur, Le Mimosa by Annick Goutal, Library Collection Opus III, Mimosa, Mimosa by Calypso Christiane Celle, Mimosa pour Moi. Bookmark the permalink. Вот это да… Персик. Как печально. Но я всё равно попытаюсь понюхать его сама. Надеясь на чудо. Из всех мной заказанных только Mimosa pour Moi by L’Artisan Parfumeur пахнет для меня мимозой с первой ноты. Ну и до последней почти, только угасая. Удивительно, что ты в нём её не чувствуешь, потому что имея дело с мимозой для варенья весь последний месяц — уж я её нанюхалась! (смеюсь) Абсолютно точное воспроизведение запаха цветов на мой нюх. В каких-то из мной опробованных, уже забыла в каких… аромат мимозы появляется второй нотой. А одни духи, заявленные как мимозовые, мне совершенно мимозой не пахнут, но они волшебно необычные и никого из услышавших их запах почему-то не оставляю равнодушными. Хотя, возможно они так пахнут именно на моей коже. Названий я конечно не помню. Но я усядусь и опишу у себя в жж ощущения в подробностях. If for you Mimosa pour Moi does smell like mimosa you should definitely try Le Mimosa: if you can get past that peach scent you will smell mimosa – well, at least the version which is close to L’Artisan’s one. I did try Une Fleur de Cassie by Frédéric Malle and I like it. But I think it’s closer to Amarige which I like. In LJ you mentioned Cacharel’s Lou Lou. I didn’t see any mimosa in notes listed for the perfume but since I have a mini bottle of it I did test it. If to get through the burnt rubber smell I get from it, there is something that reminds of, again, Amarige’s version of mimosa but not interesting enough for me to actually wear the perfume again. The Posh Peasant lists Cacharel’s Lou Lou as the one with mimosa note, so I got it to try. I don’t smell either, but it’s the one that attracted a few people when I was wearing it. I do not have enough experience to describe it, but I’d say it belongs to 30-40th of 20th century. Very powder like and classy, yet extravagant. I cannot say I like it, but it was an unusual experience. Parfumes de Nicolia Mimosaique starts as nothing like mimosa, very sweet and, forgive me for my ignorant judgment, cheap. But in half an hour or so it changes completely to a bitter-spring-close-to-mimosa something. I cannot say I am impressed by the smell per se, but it is interesting to observe the way it works on my skin. Une Fleur de Cassie by Frédéric Malle will be my next approach, thank you. I am not satisfied so far. It’s for the best that you didn’t like Mimosaique – it’s discontinued and would be harder/more expensive to get. I’ll save Mimosa by Calypso Christiane Celle for you to try, so do not spend money on this one. Yes, thank you! Would you like me to save something from my “mimosa quest” for you? I am about to order Une Fleur de Cassie by Frédéric Malle and Annick Goutal’s Le Mimosa to try. I’d like to add something полынное. Do you have any sudgestions? Nope, sorry – not my cup of tea, so no valid suggestions. Read about this one. I haven’t tried it yet though so I have no opinion about it. Thank you, Axum. Glad to see you here. Though you cannot find this perfume on Parfums de Nicolai’s website you can probably still get some decants or a full bottle online. Mimosa is a note I’ve been thinking of exploring. I thought I would start with Une Fleur. If you have received your sample, I’d be interested to know if you think that is a good starting point. Today I finally tested it (not for the first time ever but for the first time after you posed the question). I do like Une Fleur de Cassie and I think I can smell some mimosa in it but it’s not a dominating note. And, in general, I do not think I like it enough to want to wear beyond the sample.